Plast Aesthet Res 2018;5:19.10.20517/2347-9264.2018.24© The Author(s) 2018. 1Research and Development Department, Kylane Laboratoires S.A., Plan-les-Ouates 1228, Switzerland. 2Surgeon Roma Plastic Surgery Center Private Practice, Roma 00199, Italy. 3Clique Clinic Private Practice, Petaling Jaya 46300, Malaysia. 4Dr. Patrick Micheels Private Practice, Genève 1206, Switzerland. 5Clinique Internationale de Dermatologie Genève S.A. Private Practice, Genève 1201, Switzerland. Hyaluronic acid (HA) fillers are recognized as the gold standard in aesthetic medicine to treat signs of facial ageing; i.e. for filling wrinkles and skin depressions, and to shape the volume of the face. In 2016, according to the American Society for Aesthetic Plastic Surgery (ASAPS), 2.49 million HA filler treatments were performed in the United States of America only with a high growth of 16.1% versus the previous year. Since the market launch of Juvéderm Voluma (Allergan, Pringy, France) in 2010, the first HA volumizer and current world market leader in this segment, there has been a growing interest from physicians for HA fillers with a high ability to project the skin tissues. Juvéderm Voluma is produced thanks to the VYCROSS proprietary technology. This technology uses a combination of low and high molecular weights of HA during the crosslinking to improve the efficacy of the chemical reaction. Recently, a novel proprietary manufacturing technology for the production of innovative HA fillers has been discovered. It is the OXIFREE technology (Kylane Laboratoires, Geneva, Switzerland) which is characterized by the extraction of destructive oxygen during the manufacturing process, including during the crosslinking step, to significantly preserve the intrinsic properties of the high molecular weight of HA chains. This new technology provides HA fillers with advanced rheological properties which makes it possible to exhibit strong projection capacities and therefore a high ability to restore the volume of the facial skin tissues. Volumizer products such as Juvéderm Voluma or the HA fillers benefiting from the OXIFREE technology are designed by the manufacturers to be injected into the subcutaneous tissues and the supraperiostic zone. For these products, high projection capacity is thus required to efficiently treat the areas of the face for which the creation of volume is necessary such as the cheeks, cheekbones, chin, temples and jawlines. Rheological properties are also naturally considered by the manufacturers to design their products because these properties have an essential importance on the mechanical behavior of the HA gel in the tissues[5-7]. Many publications have been published on this topic over the past few years and some of them have highlighted the key role of the normal force FN for the tissue projection of the HA fillers[8-11]. In this publication, a new skin model assay is proposed to assess the projection capacity of the HA fillers. This assay is applied on Juvéderm Voluma, the market leader in the segment of the volumizers, and a new HA filler benefiting from the OXIFREE technology, to compare the projection capacities of these products. The results obtained with this skin model assay are then discussed, with special consideration of the key rheological characteristics of these two products. Two crosslinked HA fillers intended for facial injection in aesthetic medicine were subjected to flow, oscillatory shear-stress and compression tests with a DHR-1 rheometer (TA Instruments, New Castle, USA). Among these two HA fillers presented in Table 1, one is manufactured according to the novel OXIFREE technology and one is Juvéderm Voluma (Allergan, Pringy, France), manufactured according to the VYCROSS technology. The two crosslinked HA fillers are studied in terms of rheological properties and also with the new skin model assay. The flow test enables the measurement of the viscosity η of the gel. It was performed at a temperature of 25 °C under shear rate from 0.001 to 1000 s-1 with a cone/plate aluminium geometry of 40 mm 2 degrees and a 50-µm gap between the cone and the plate of the rheometer. The value of the viscosity η is measured at the shear rate of 1 s-1. The oscillatory shear stress test enables the measurement of the elastic modulus G’. It was performed at a temperature of 25 °C in shear stress oscillation mode at 1.0% of strain, within the linear viscoelastic region, with a cone/plate aluminium geometry of 40 mm 2 degrees and a 50-µm gap between the cone and the plate of the rheometer. The measurements were carried out over a frequency range of 0.1-5 Hz. The value of the elastic modulus G’ was measured at the physiologically oscillation frequency of 1 Hz. The compression test in static mode enables the measurement of the normal force FN. It was performed at a temperature of 25 °C in normal force mode, with a cone/plate aluminium geometry of 40 mm 2 degrees: 1.0 g of gel was placed between the cone and the plate and the cone was set in contact with the gel and lowered toward the bottom plate, thus compressing the gel. The normal force (FN) was measured for a gap between the cone and the plate of 1.11 mm (inverse gap = 0.9 mm-1). The compression test in dynamic mode enables the measurement of the elastic modulus E’. It was performed at a temperature of 25 °C in compression oscillation mode at 1.0% of strain, within the linear viscoelastic region, with a 40 mm plate/plate aluminium geometry and a 0.5-mm gap between the parallel rheometer plates. The measurements were carried out over a frequency range of 0.1-5 Hz. The value of the elastic modulus E’ was measured at the physiologically oscillation frequency of 1 Hz. All measurements were carried out in triplicate. Data were expressed as the mean ± standard deviation. Coefficients of variation lower than 10% were considered as satisfactory. Results were evaluated statistically using Student's t-test with a level of significance fixed at α = 0.05. The skin model “Injection trainer” (Limbs and things, Bristol, UK) used to assess the projection capacity is composed of multiple tissue layers: epidermis, dermis, fat and muscle. This artificial skin model could be used for training in order to practice intradermal, subcutaneous and intramuscular tissue injection techniques. The skin layers can be peeled back. - The projection height induced by each HA gel’s bolus is measured in millimeter [difference between the top and the baseline of the ellipse (baseline is plotted between the two bending points of the ellipse)]. 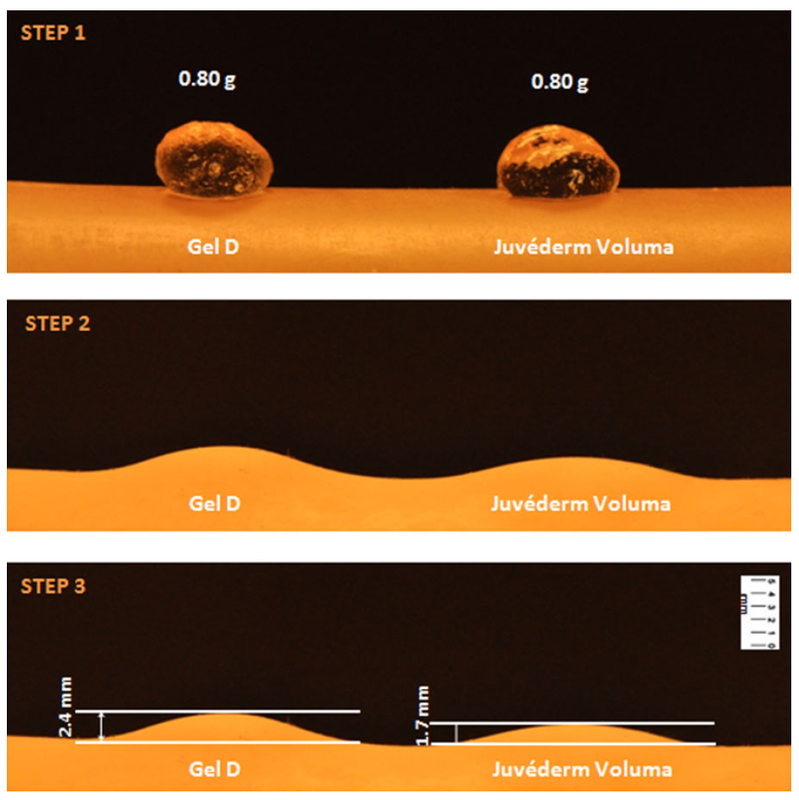 One test is performed with Juvéderm Voluma on the left of the skin model and gel D on the right and a second test is performed with Juvéderm Voluma on the right of the skin model and gel D on the left. Each test was carried out in triplicate. Data (projection heights) were expressed as the mean ± standard deviation. 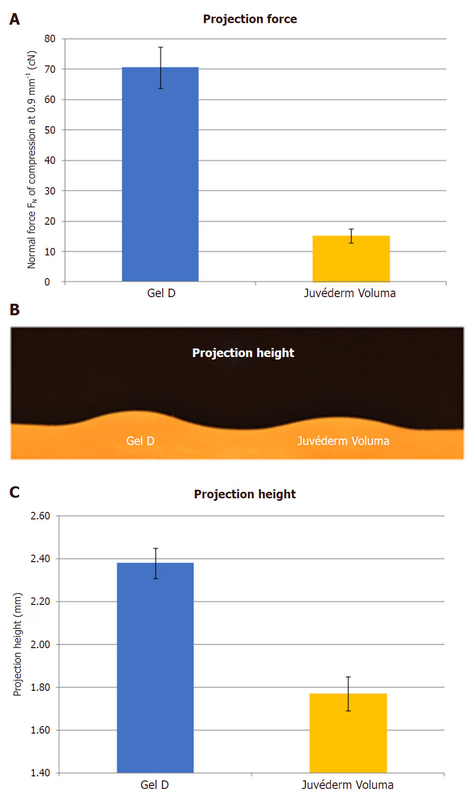 A statistical test is used to compare averages between the six projection heights of Juvéderm Voluma and the six projection heights of gel D (OXIFREE technology). In this bilateral test (comparison of the difference of two averages at a given value), the difference of the averages (Juvéderm Voluma and gel D) is compared to the D0 value. D0 value is fixed as equal to zero, allowing to test the equality of the two averages. The key rheological properties viscosity η, static compression FN, elastic modulus in dynamic shear stress G’ and elastic modulus in dynamic compression E’ were measured on Juvéderm Voluma and a new HA filler (gel D) benefiting from the OXIFREE technology. The results are summarized in Table 2. The projection heights measured with the skin model assay are illustrated in the Figure 1 and the overall results are summarized in Table 3. By statistically comparing averages between the six projection heights of Juvéderm Voluma and the six projection heights of gel D (OXIFREE technology), the two averages (Juvéderm Voluma and gel D) are statistically different. The novel OXIFREE product gel D exhibits 34% more projection height compared to Juvéderm Voluma. With the new skin model assay presented in this publication and applied on two HA volumizers, including the market leader Juvéderm Voluma, the projection heights are reproducible and significantly different for the two tested products. This new assay is thus efficient and reliable to assess the ability of a HA filler to project and create volume. The projection height measured with the assay can be assimilated to the capacity of the tested gel to push the skin tissues and therefore to project them for facial volume restoration. Consequently, the assay is very useful for comparing the projection capacity of HA fillers, especially among HA volumizers. In the case of the two HA volumizers studied in this publication, the projection height measured with the skin model assay is significantly and statistically higher for the novel OXIFREE product than Juvéderm Voluma. The projection capacity obtained with the OXIFREE product is therefore higher than Juvéderm Voluma. This finding is consistent and in correlation with the rheological properties of the two studied HA volumizing products. As described in previous publications on the key rheological features of HA fillers, the normal force of compression FN plays a key role in the projection capacity of the HA fillers: a high FN enables the HA product to project more skin tissues. In this regard, the normal force FN of compression can also be called the projection force to highlight its importance in the ability of tissue projection and volume creation. In the case of the OXIFREE product and Juvéderm Voluma, as illustrated in Figure 2, the projection force FN and the projection height are considerably higher for the OXIFREE product in comparison to Juvéderm Voluma, which explains the much higher projection capacity of the OXIFREE product observed with the skin model assay. The measurement of the projection capacity with the skin model assay is hence a new relevant tool for the medical community, in addition to and in correlation with the rheological property FN, to assess and compare the projection capacities of HA fillers. For the physicians, it makes it possible to select the HA volumizers with the highest projection capacities to treat facial indications which require important volume restoration such as the cheeks, cheekbones, chin, temples and jawlines. This selection enables the optimization of the aesthetic outcomes and a better patient satisfaction. In addition to the ability to demonstrate the projection capacity of the HA fillers, this new skin model assay is easy and quick to perform, which makes it possible to visually observe the projection capacity of the products on an applied model. In conclusion, volumizing products play an increasingly important role in the minimally invasive aesthetic procedures and they significantly contribute to the growth of the HA filler market on the world scale. HA volumizers have been demonstrated to be the gold standard solution to restore facial volume loss, especially for the correction of the midface with key clinical indications for the rejuvenation of the face such as the treatment of the cheeks, cheekbones, chin and jawlines. Rheological characteristics analysis was demonstrated to be very useful for the physicians in order to guide them in the selection and usage of the most relevant products, administration techniques and depths of injection for the intended treatment. This publication presents a new skin model assay to evaluate the projection capacity of HA fillers. This skin model assay was proven to be reliable and reproducible with two HA volumizers, including the market leader Juvéderm Voluma. It allows easy highlight of the ability of a HA filler to project the tissue and to create volume. It also enables a comparison of the projection capacity levels of different volumizing HA products. This model is therefore considered as a new key tool, complementary to the rheological property of projection force FN, to assess the projection capacity of the HA fillers. The additional acquired knowledge obtained with this new skin model assay contributes to a better characterization of the HA fillers which could be selected and used by the physicians for optimizing their aesthetic outcomes, as well as patient safety and satisfaction. Data in this study were derived from searches of the PubMed database. Experimental data were obtained by Kylane Laboratoires S.A.
Kylane Laboratoires S.A. provided the logistical and financial support for the execution of this study. Mr. Samuel Gavard Molliard is employed by Kylane Laboratoires S.A., Mr. Basste Hadjab and Mr. Jérémie Bon Betemps serve as consultant of Kylane Laboratoires S.A.
2. American Society of Plastic Surgeons. 2016 Plastic Surgery Statistics Report. Avaiable from: https://www.plasticsurgery.org/news/plastic-surgery-statistics?sub=2016+Plastic+Surgery+Statistics [Last accessed on 26 Jun 2018]. 3. De Maio M, DeBoulle K, Braz A, Rohrich RJ, Alliance for the Future of Aesthetics Consensus Committee. Facial assessment and injection guide for botulinum toxin and injectable hyaluronic acid fillers: focus on the midface. Plast Reconstr Surg 2017;140:e540-50. 4. Goodman GJ, Swift A, Remington BK. Current concepts in the use of Voluma, Volift and Volbella. Plast Reconstr Surg 2015;136:S139-48. 5. Sundaram H, Rohrich RJ, Liew S, Sattler G, Talarico S, Trévidic P, Molliard SG. Cohesivity of hyaluronic acid fillers: development and clinical implications of a novel assay, pilot validation with a five-point grading scale, and evaluation of six U.S. Food and Drug Administration-approved fillers. Plast Reconstr Surg 2015;136:678-86. 6. Tran C, Carraux P, Micheels P, Kaya G, Salomon D. In vivo bio-integration of three hyaluronic acid fillers in human skin: a histological study. Dermatology 2014;228:47-54. 7. Sundaram H, Cassuto D. Biophysical characteristics of hyaluronic acid soft-tissue fillers and their relevance to aesthetic applications. Plast Reconstr Surg 2013;132:S5-21. 9. Gavard Molliard S, Albert S, Mondon K. Key importance of compression properties in the biophysical characteristics of hyaluronic acid soft-tissues fillers. J Mech Behav Biomed Mater 2016;61:290-8. 10. Gavard Molliard S, Bon Bétemps J, Hadjab B, Topchian D, Micheels P, Salomon D. Key rheological properties of hyaluronic acid fillers: from tissue integration to product degradation. Plast Aesthet Res 2018;5:17. 11. Pierre S, Liew S, Bernardin A. Basics of dermal filler rheology. Dermatol Surg 2015;41 Suppl 1:S120-6.